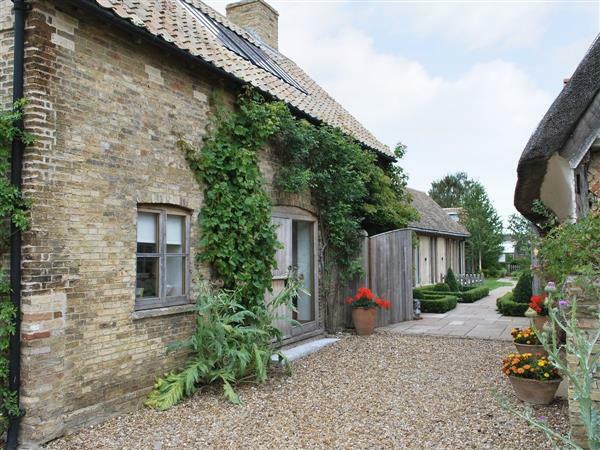 The Barn at Butts Farm in Wicken, near Ely, Cambs sleeps 4 people. Set in the grounds of the owner’s Grade II listed 17th-century farmhouse, this detached holiday cottage is an architect-designed conversion of a 19th-century granary. Situated in a quiet village location, the barn overlooks a landscaped Japanese garden. The property is a short walk from the National Trust’s oldest nature reserve, Wicken Fen, a wetland SSSI, with its extensive walks, cycle trails and waterways. Wicken is well placed for exploring Ely, 8 miles, Newmarket, 7 miles, and Cambridge, 13 miles. Shop 2½ miles, pub 100 yards. Spacious, beamed living room with open fire in large stone fireplace, vaulted ceiling and oak floor. Dining room with French doors. Fitted kitchen. Double bedroom with 5ft bed, French doors, wooden Japanese hot tub, vaulted ceiling and oak floor. Shower room with toilet. Cloakroom with toilet. First floor: Twin bedroom. For a better idea of where The Barn at Butts Farm is, you can see The Barn at Butts Farm on the map below. The Barn at Butts Farm is in Cambridgeshire; should you be on the lookout for a special offer, you can find all the special offers in Cambridgeshire. It's always worth checking to see what is on offer at the moment. Do you want to holiday near The Barn at Butts Farm (RCCE), you can see other cottages within 25 miles of The Barn at Butts Farm; have a look to find your perfect holiday location.